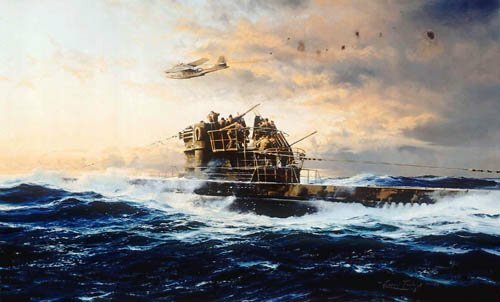 Robert Taylor's painting portrays the renowned defiance of the U-Boat crews. Caught on the surface by a PBY Catalina the gun crews of a type VIIc U-Boat are quickly into action. The 3.7cm anti-aircraft gun is hurriedly reloaded while on the upper platform the two 2cm anti-aircraft twins take chunks out of the Catalina's tail - enough damage to secure a respite from the attack. Soon they will dive to relative safety beneath the Atlantic swell. Prints are signed by submariners of the German Kreigsmarine, all of whom are holders of the Knight's Cross.